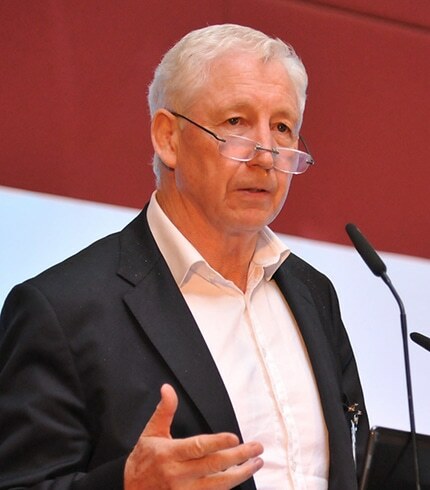 Kingsley Aikins was born and brought up in Dublin and educated at The High School, Dublin and Trinity College Dublin, from which he graduated with an honors degree in economics and politics. He also has a post-graduate Diploma in International Marketing and has studied and worked extensively in France and Spain. For five years he was the Sydney, Australia based representative of the Irish Trade Board and the Industrial Development Authority (IDA) of Ireland. He was a founding director of The Australian Ireland Fund and for two years served as Executive Director responsible for the growth of the Fund in Australia and setting up The Ireland Fund of New Zealand. In January of 1993, Kingsley Aikins moved to Boston to take over as Executive Director of The American Ireland Fund. The Fund was set up in 1976 and since then The Worldwide Ireland Funds have raised over $300 million for projects of Peace, Culture, Community Development and Education throughout the island of Ireland. In June 1995 he was appointed Chief Executive of the Worldwide Ireland Funds now active in 13 countries including Ireland. He is a member of the Institutes of Marketing, Export and Linguists. He was also responsible for the successful five-year Hope and History Campaign to raise $100 million. After 21 years he left The Ireland Funds and runs a consultancy company based in Dublin called Diaspora Matters which gives advice on diaspora issues to governments, corporates and individuals. Kingsley represented Trinity College, Irish Universities, Vichy (France) and Leinster in rugby. In 2008, Kingsley was awarded a CBE for his work on British-Irish relations. He is married with three children and lives in Dublin. Kingsley Aikins writes and speaks extensively on Philanthropy, Diaspora and Networking and in 2011 produced a Global Diaspora Strategies Toolkit and in 2012 was the keynote speaker at the Hillary Clinton Global Diaspora Forum in Washington. In May of 2013, he chaired the European leg of the Global Diaspora Forum in Dublin. He was an outstanding MC for the Pendulum Summit and has spoken at TEDx Vilnius on the topic Diaspora Matters.